This big, bold colouring and activity book features favourite Bible heroes and Veggie characters. Crosswords, colouring, secret codes, mazes and more! Perforated pages let kids "Tear and Share" their activity pages. 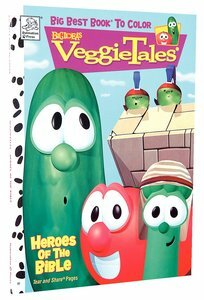 About "Veggie Tales: Heroes of the Bible"
Cut Out Puzzle Directions: 1. Ask an adult for help. 2. Cut out along the dotted lines. 3. Have fun unscrambling the puzzle pieces to make a picture of Dave and the Giant Pickle. With ten years of grassroots success, over 30 million videos sold, and a blockbuster feature film, the inspirational VeggieTales property has proven appeal! Parents love the value-based, educational stories, as well as fhe witty word play. Kids love the bright, friendly characters who tackle everyday issues with understanding and humor. Wacky personalities, good stories and lots of silly fun make VeggieTales products from Dalmatian Press a must-have!